Catavino has traveled more this year than ever before, and just when life has settled to a peaceful calm, we’re off again. This past weekend we visited Benidorm, Spain, a place that you should see at least once in your life; not for the wine, mind you, but for the odd combination of location, tourism and the sheer mass of humanity. We attended the inaugural conference of Road Web TV, and having very little concept of what we were walking into, we were especially impressed by the results of the event. The idea was simple: get everyone related to webtv in Spain in one location and see what happens! What happened was a considerable amount of conversation, brainstorming and networking. It was exciting to see so much fervent energy and creativity around video blogging in Spain, while truly promoting it as a valid and an incredibly affective tool in new media. Thanks to everyone who took the time and energy to make the conference such a success. Have you ever had a Lopez de Heredia white wine? We still have a few bottles of 1989 vintage laying around, and if you try one, you will see that Rioja doesn’t have a problem with its white wines. This wine is amazing, but it takes a long time to make and few people have the patience. Hence, the quote above should read: “With these new varieties, we are trying to avoid having to do any real work to make great wines from the grapes we already produce.” In other words, quality whites from Rioja take effort. AddingÂ Sauvignon Blanc, Chardonnay and Verdejo, as well as the native Maturana Blanca, Tempranillo Blanco, and Turruntés just makes it easier to make commercial wines faster. Then again, bodegas like Tobia and Dinastia Vivianco in recent years have proven that you can make great whites if you have a little patience. Their recent releases have been crowd pleasers and still adhere to tradition. Please let us know if you want to enter! Classes start next week in Denver, and throughout the rest of the US following this schedule. We would love to see bloggers, not just wine bloggers, attend this certification, as it is a great opportunity to learn about the wines we adore! To make the deal even sweeter, we’re going to offer a free DeLong Iberian Wine Map to the first person to send in a post for the contest! So make sure to leave a comment and link here to enter! 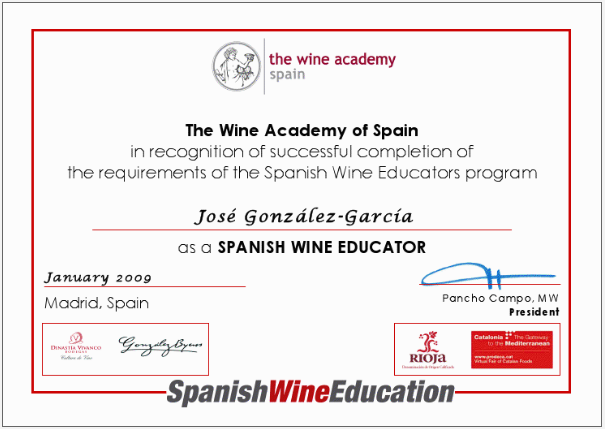 All it takes is a postÂ answering the following: why do you want to learn more about Spanish wine? You can write an article, make a video, take a descriptive picture, or record a podcast. If you can’t find a date that works, please pass on the information to people who you think can! Don’t let this opportunity slip by! Finally, at the Road Web Tv Conference, we had the chance to participate in a small casual tasting. Bodegas Enrique Mendoza contributed the wines, and we tasted the 2005 Shiraz and the 2004 Santa Rosa. Gabriella and I both found that the Shiraz was either not showing well or had a fault. Our first glass was bitter and acrid, and the second while better, still did not do anything for either of us. That said, the Santa Rosa was very nice, rich and complex, though sadly, we were drinking out of cheap bar glass, so the wines did not have time to breathe. Interestingly, earlier in the day, we also tasted their Chardonnay and a 2008 off-dry Moscatel. The Chardonnay was nice, though a bit austere, and lacking the weight I was I looking for. That said, the Moscatel was a brilliant balance of sweetness and acidity, which combined beautifully with a light perfumey nose. This is a highly recommended treat!